One of the signature onboard activities that Royal Caribbean has become well-known for is the rock climbing wall. Since the first rock climbing wall debuted on a Royal Caribbean ship, the experience has spread to every other ship in the fleet making it a favorite among guests. 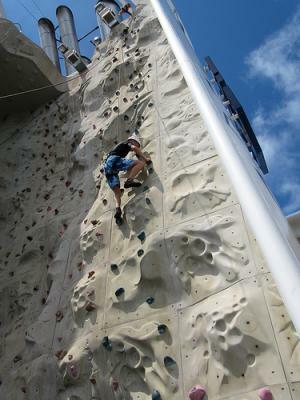 Rock climbing walls were added to all of Royal Caribbean's ships following great guest feedback. The 30-foot rock wall offers different tracks for various experience levels and is open for most of the day. It's open to kids and adults and Royal Caribbean provides all the safety equipment that you will need, including helmets, harnesses and shoes. You just need to bring a pair of socks. Climbers need to be at least 6 years old and sign a waiver. Climbing the rock wall is free and no reservations are required. For advanced climbers, Royal Caribbean will offer advanced climbing sessions, speed-climbing competitions and for teens, teen tournaments. On the Oasis class cruise ships, you will find two rock climbing walls, which offer double the capacity of climbers compared to other ships in the fleet. What makes the rock climbing wall so much fun is that it is an exhilarting challenge to try and climb up all the way to the top and ring that bell to let everyone around know you conquered it. There are different paths on the rock wall to allow beginner climbers and advanced climbers alike have a go at it. Once you conquer one side, try the next side! Royal Caribbean's rock climbing walls are a great way to stay active, challenge yourself and have fun all at the same time! Have you tried the rock climbing wall yet? Tell us how you did in the comments! 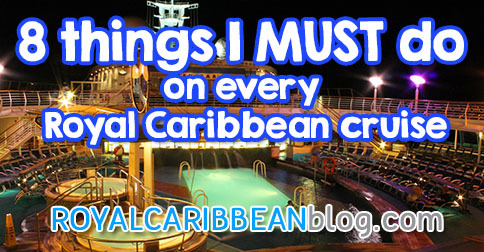 We all have those traditions on a Royal Caribbean cruise that we just feel compelled to do each and every cruise. There's something about certain aspects of a Royal Caribbean cruise that keep us coming back again and again. Here are a few must-do things that you just have to try on your next cruise too! It's not a cruise unless we get to the port a little before noon and get onboard so I can have my first meal in the legendary Windjammer Cafe. There's something about having my first meal here that cements that feeling inside of "I'm really on a Royal Caribbean cruise again". For me, it's that moment when I sit down with my plate full of food and a big smile comes across my face. And oh yea, there's lots of good food to be enjoyed here as well! 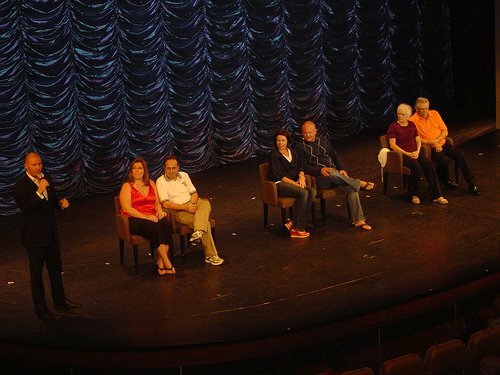 A staple of Royal Caribbean's nighttime entertainment is the Love and Marriage game show. Even though I think I know all the questions they will ask by heart, the answers the contestants give always make for an entertaining experience. I freely admit I am far too shy to volunteer for the show, but seeing this show is always a lot of fun and one of the things we will be talking about during the rest of our cruise. Anyone can swim during the day but on a Royal Caribbean cruise, but I love to put on my bathing suit late after the sun goes down and hop in the pool. Night swims are a great experience and with the new giant movie screens near the pools on most Royal Caribbean ships, it's fun to take in a classic film while being in the water. It's a great family activity and the perfect way to end a fun day. No Royal Caribbean cruise is complete without booking another Royal Caribbean cruise to start looking forward to. As the days left on our cruise start to wane, I want to have something else to have in mind to make disembarkation day just a little bit easier. My wife and I will sign up for an appointment with the Loyalty Ambassador and go over some options either back onboard the ship we are on or maybe something completely new. You know what they say, nothing gets you over the last one like the next one! Royal Caribbean offers so many great specialty restaurants to choose from but the one that I always have to go back to is Chops Grille. 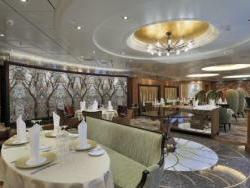 It's become a staple of Royal Caribbean and it's a restaurant I can always book without even having to consult my wife. What I love about Chops Grille is the consistently good experience across all ships in the fleet. Each one we visit is always a memorable experience with some of the best steaks and side dishes we've had in a long while. This may be just something silly I do but I really love to watch the shore excursion channel in my stateroom when we're laying around. There's something about the super market jazz music playing in the background or the monotone voice over descriptions that I just like watching it. This guilty pleasure is centered around the idea of watching this channel to get an idea of what to expect in the ports of call we are going to visit but I find the channel strangely memorizing and I'm not afraid to admit it! Picture this: a sunny day with maybe just a few clouds passing by, sitting in a lounge chair at the pool deck with an optional drink of the day in your hand and the band playing "Red Red Wine" as you take a sip and close your eyes. That is the perfect moment on a Royal Caribbean cruise for me. 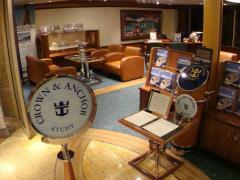 The live music on a Royal Caribbean cruise is among the best hidden secrets. Royal Caribbean's dedication to live music has become something I always look forward to and enjoying the live band at the pool is just the icing on an incredible cake. When we get back to the stateroom after a great dinner, the first thing I look for is the next day's Cruise Compass newsletter waiting for me on the bed. Each evening your stateroom attendant will leave the Cruise Compass on your bed (with perhaps a towel animal surprise too) for you to read and I love reading everything inside. To me, this is the New York Times of cruising and it's just one of those cruising traditions that I love to do. Sure, I get a sense of what activities are coming up the next day (Michael Jackson line dancing classes anyone?) but it's also fun to just immerse myself in everything going on around the ship. Did any of my favorite must-do's make your list? Share with us your favorite Royal Caribbean traditions in the comments below! Doing EVERYTHING on a Royal Caribbean cruise: What would it cost? 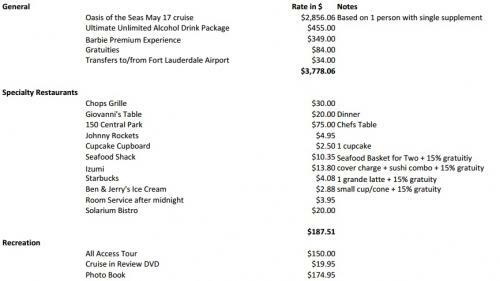 I was inspired by a friend, who wrote a blog post about what it would cost to do everything in Walt Disney World, to figure out how much would it cost to indulge and do everything on a Royal Caribbean cruise. After all, Royal Caribbean is always looking for ways for its guests to spend money and there's a lot available to do on Royal Caribbean ships. In order to figure this out, I need to set up this hypothetical experiment. First, we have to define the parameters of our research. We will assume this would be attempted on a single Royal Caribbean ship (sorry, trying to do everything across the entire fleet just isn't practical). Next, I have to come up with what constitutes "doing something". If there's an excursion that offers cave tubing and a beach break and then there's another excursion with just a beach break, does that mean I need to do both or just one? The all encompassing excursion sounds good to me. All the prices and assumptions you will see are assumed for one person. It's easier to calculate for just one person and if by some miracle I could ever win the lottery, then I suppose I could bring someone else along. Until then, this is a solo experiment (sorry wife and daughter). Next is the ship. Royal Caribbean has a lot of ships and what they offer on one ship may not be available on another. I decided to pick Oasis of the Seas with the idea being it's their flagship class and thus, offers the latest and greatest and in my experience, has the most to offer its guests. What about the stateroom? There are many different stateroom types on Oasis of the Seas. It would be all but impossible to stay in every one of them. To simplify things, I decided to price out the cost for my arbitrary cruise for what would allow me to credibly say that I had stayed at that hotel. Usually this meant I chose the cheapest balcony cabin. It's not as cheap as inside but not as crazy expensive as a suite. For the specialty restaurants, the cover charge restaurants are the easiest since it's a flat fee. For the a la carte restaurants, I decided to pay whatever cover charge there was plus one entree. There isn't any more logic here than "sounded good at the time". For everything else, I had to use my judgement for what to include and exclude. In the case of ordering cakes, I decided one cake was all I needed. In the case of spa treatments, if there were spa treatments with different times, I chose the longer one. For shore excursions, I picked one shore excursion per port since you really can't do more than one per day, per cruise. I included no discounts or coupons in the prices. I haven’t factored transportation fees into my plan at all. I’d need a flight and certainly a rental car. Or possibly I’d drive down and then have gas expenses throughout. As I said, I picked Oasis of the Seas as my guinea pig. I wanted to pick an "average cruise" so Christmas or other holiday cruises are way too expensive, as are hurricane season cruises. I went with May since it's after spring break and before the real summer rush. Here is a link to the spreadsheet I used for figuring everything out. The largest chunk of cost comes from the spa, which when you add gratuity to all the service costs comes out most expensive. This is followed up by the basic cruise costs plus a few basic add ons. Gifts are next up in terms of cost followed by excursions, restaurants and other miscellaneous items. Relatively speaking, the specialty restaurants don't really add up and to me, that was a surprise. The spa cost being the most expensive is eye opening but then again, I think most people realize the spa services are somewhat expensive to begin with. 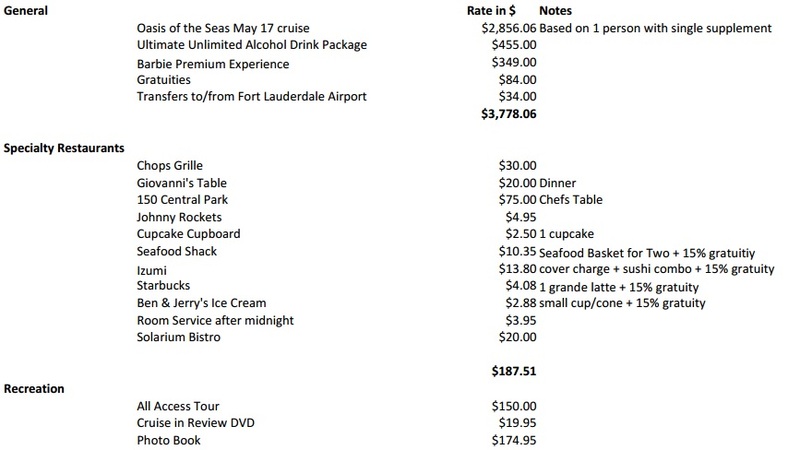 Adding it all up, the total for everything on this cruise is $11,840.75. Our price does not include transportation, which would probably add a few hundred dollars or so for either a flight and a car rental, or auto wear and tear and gas. Read more about Doing EVERYTHING on a Royal Caribbean cruise: What would it cost? Royal Caribbean has made a name for itself by offering fun things to do onboard its ships, especially things that are unique and new to the cruise industry. When Oasis of the Seas was built, among the many innovations that WOW'ed guests, was something elegant and simple: a carousel. 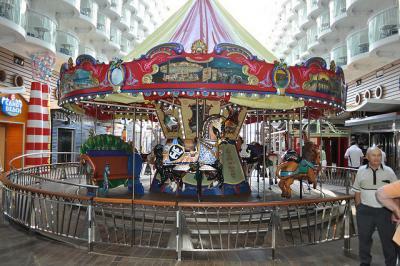 Located in the Boardwalk neighborhood on Oasis of the Seas and Allure of the Seas, is the first ever carousel-at-sea. Hand-crafted and especially designed by Carousel Works for Royal Caribbean International, this full-sized, traditional carousel is truly one-of-a-kind. Given that the Boardwalk area is inspired by the nostalgic seaside boardwalks of the past, it's a modern tribute to a time gone by. The carousel uses turn-of-the-century carousel designs as its basis down to the very last detail. 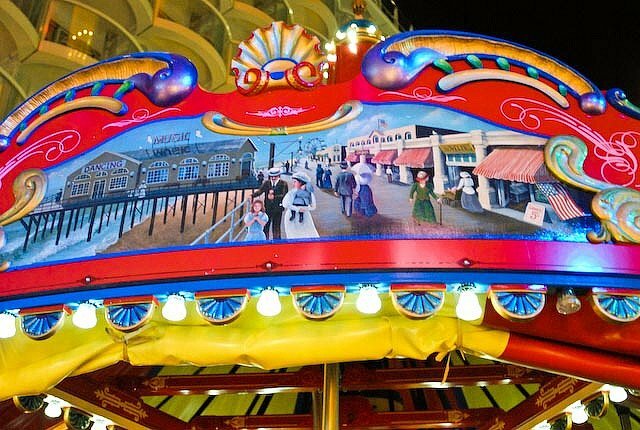 Even the original artwork scenery panels located on the carousel’s eight Rounding Boards feature custom painted scenes to highlight the wistfulness of life on the historic boardwalks. 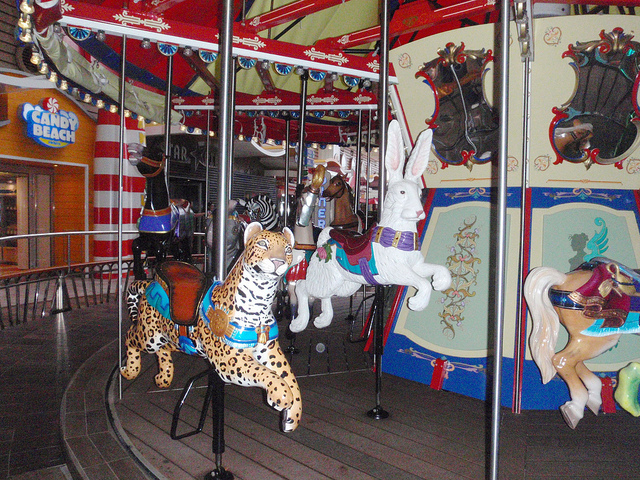 In addition to the great history, the carousel is just plain fun for kids and adults. Eighteen figures are suspended from stainless steel poles along with one ADA accessible chariot that were created from poplar wood populate the carousel. 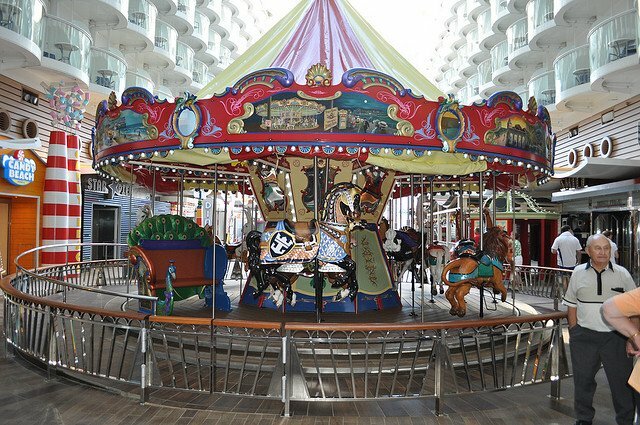 There are eleven carousel horses that follow a tradition carousel design, including one intricately designed Royal Caribbean lead armored horse, that even features the crown and anchor logo. Designers also included other animals such as a zebra, giraffe, jaguar elephant, lion and even a crowned frog prince. The stationary chariot on Oasis of the Seas is an elegant peacock, while the stationary chariot on Allure of the Seas is an elegantly adorned traditional carriage. 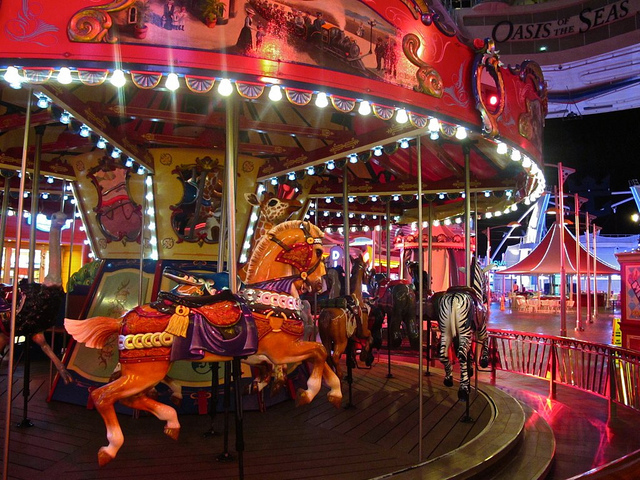 Be sure to also check out the carousel at night because like the fairs of the past, nighttime is when these rides really shine when they are all lit up. No cruise on an Oasis-class ship is complete without at least one ride on the carousel, with perhaps an ice cream cone to compliment it. Handlebar moustache and flapper skirt optional.